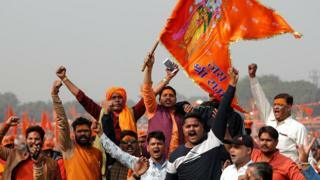 "The gathering here is telling you that Hindus won't sit back until the temple is built, and our wishes are respected," said Champat Rai, leader of the Vishva Hindu Parishad (VHP) group that organised the protest. "The government and the Supreme Court must realise that it is a matter of religious sentiment for Hindus," one monk told the gathered crowd. India's Muslim minority, which claims the right to worship at the site, say they offered prayers at the mosque until December 1949 when some Hindus placed idols of Ram inside and began to worship them. The call for the construction of a Hindu temple there has grown particularly loud in the last few months and has mostly come from members of Prime Minister Narendra Modi's Hindu nationalist Bharatiya Janata Party (BJP).